I have a literacy corner in my classroom with a variety of interesting books. The most popular books by far are the graphic novels. They have folded pages and frayed edges- signs of good use! Children of all reading abilities love graphic novels and comics. The use of complex multi modal literacy in graphic novels is now educationally recognised. 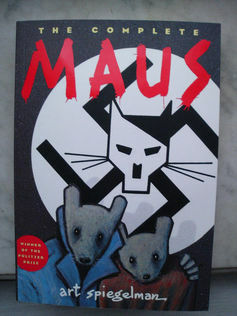 The excellent graphic novel The Complete Maus by Art Spiegelman was recently added as a prescribed text to the senior Victorian English Curriculum in Australia. Finally the fear of graphic novels as somehow less worthy literature is dispelling, and teachers now value the contribution graphic novels make to enhancing literacy education. Graphic novels are stories in comic strip format. Illustrations, panels, printed text, word balloons and captions give contextual information and create meaning. Children’s lives are multimodal. Globalization, with the exchange of culture and spread of technology has led to the need for multi literacies. Think about the ways we have to use literacy each day- emails, signs and icons, videos, tweeting, Facebook, gaming, … A pedagogy of multi literacies requires extended modes of meaning. These modes are “dynamic representational resources, constantly being remade by their users as they achieve various cultural purposes” (Cazden, Cope, Fairclough & Gee 1996 p 64). Speak to adolescents about their use of images on Tumblr blogs and you will discover how quickly these resources change in meaning. Graphic novels, comics and manga versions of children’s literature offer readers an understanding of the impact of our visual culture. Language acquisition is based on thinking visually (Britsch 2009). It is how we make meaning of the language we learn. Graphic novels, comics and manga assist children’s ability to interpret their world. Language alone does not represent reality. Our lives have become increasingly multimodal as communications extend and change, and global socio-cultural linguistics diversify the English language. 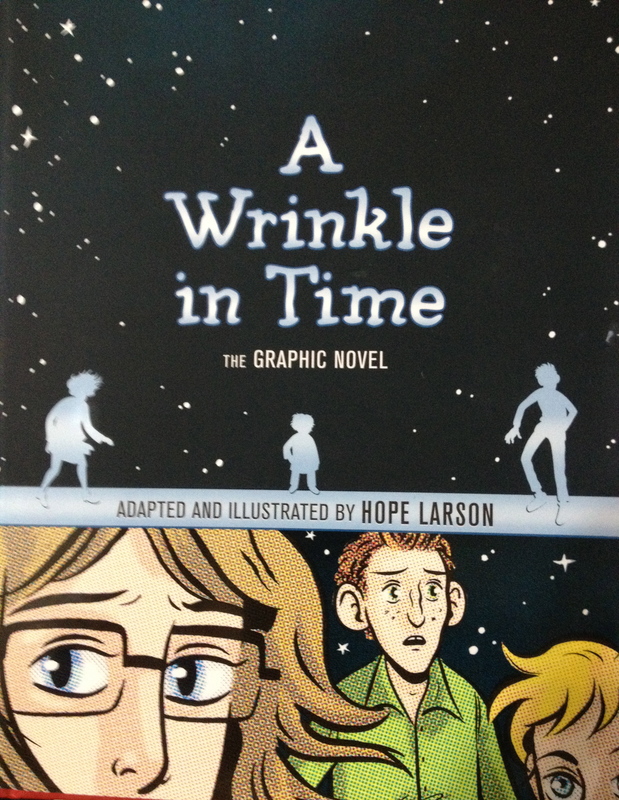 The novel A Wrinkle in Time was written by Madeleine L’Engle in 1962. 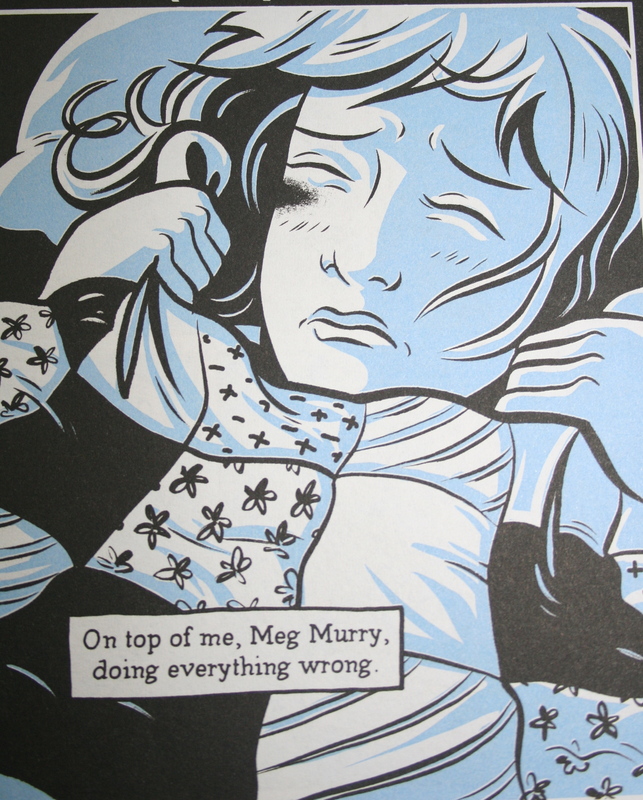 In 2012, a graphic novel version was published by Hope Larson. It encourages a new generation of readers to the classic with meaningful images. Read page one from the original text and compare the first page of the graphic novel. “It was a dark and stormy night. The graphic novel introduction page establishes time, setting and atmosphere. The reader makes inferences from the diagonal strokes, bent trees and dark shadows to create a foreboding mood. 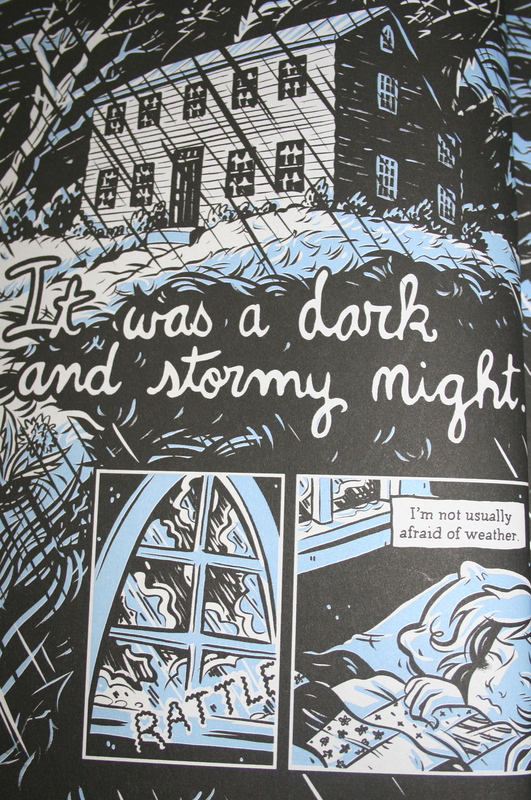 The type used for the sentence “It was a dark and stormy night” appears handwritten, suggesting a personal narrative. The reader sees the image of the wide shot and uses vectors on the roof to draw the eye to the attic window, identified in the close up. 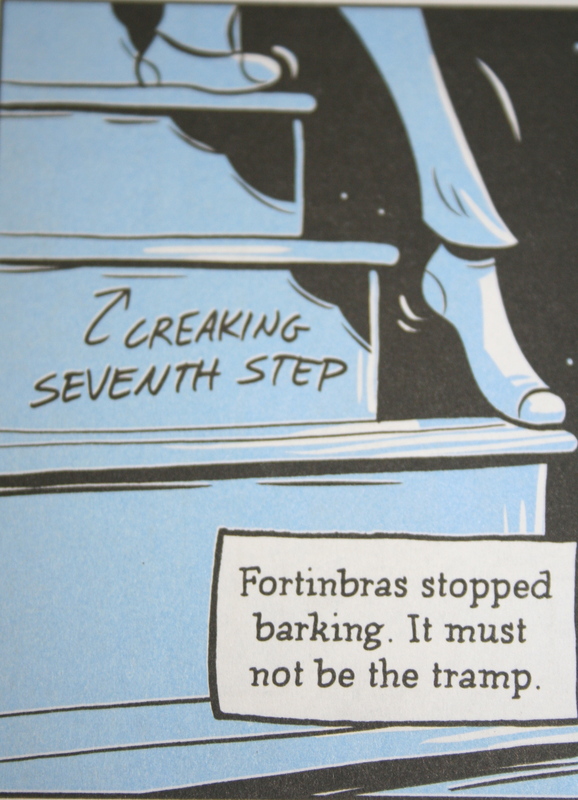 This image interprets page 5 of L’Engle’s text “she left the twin’s room and went downstairs, avoiding the creaking seventh step”. Look at how text and images work together to show meaning. The “intuitive processes” (Mouly 2011 p 12) detect movement, direction, weight, sound and time. Visual images contribute to visual culture which in turn is part of a wider culture (Mirzoeff 1999). 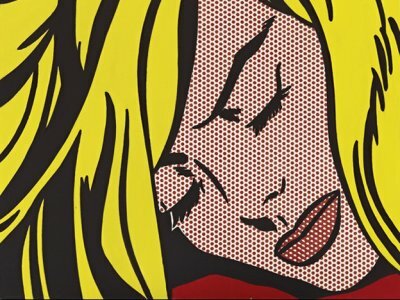 The image of Margaret Murry in the graphic novel echoes the distressed female in Lichtenstein’s pop art, showing the socio-historical continuum of comic images. Our visual memory connects the images to make meaning. The reader must also discern characters’ non-verbal gestures. Facial expressions are examined and then culturally cross-referenced. This is a serious brain workout! 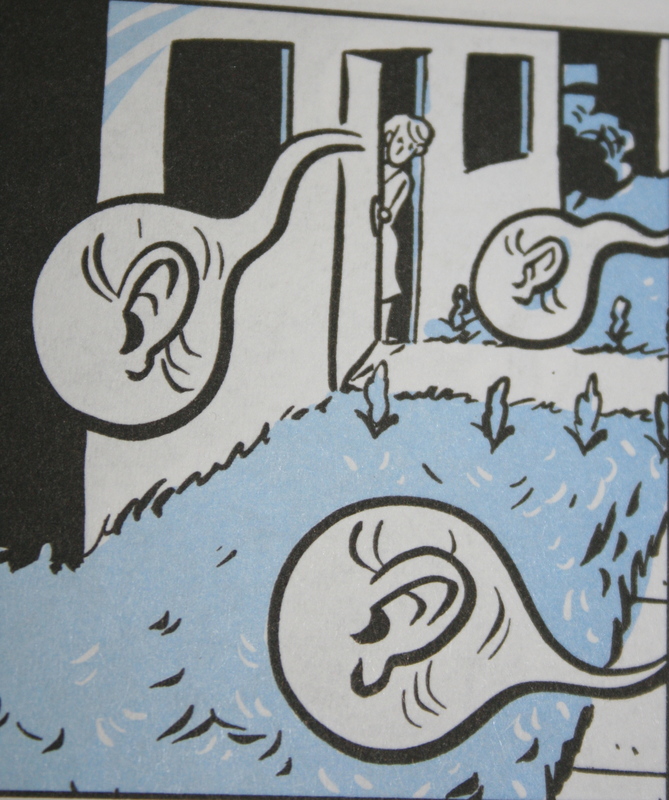 The remarkable image depicting people listening from inside their houses uses the detached symbol of the ear with lines of movement to represent the act of listening. The numerous symbols suggest many people hearing. Arnheim’s (1971) theory of prior knowledge to make meaning, is apparent. What is illustrated is as important as what is not. Here the black void creates impact and drama. 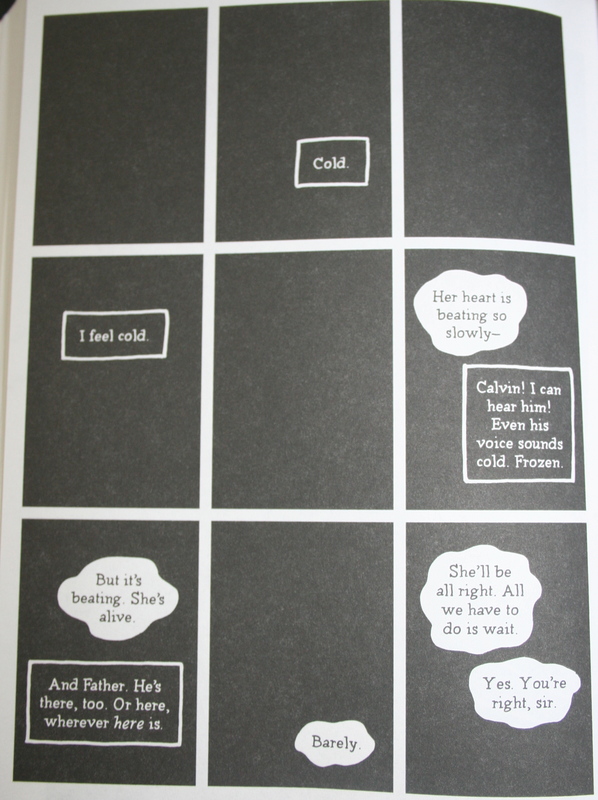 The simple 9 panels are actually sophisticated “sequential art” (Hoover 2012 p 175). Graphic novels are complex forms of literature synthesizing linguistic and visual meaning. Uses for graphic novels in the classroom can include analysis, extension reading, encouraging literacy across a range of reading abilities and as a springboard for original text composition. It’s encouraging to see many scholars researching the impact of graphic novels in literacy education. May graphic novels continue to be included in prescribed reading lists! Are international schools creating global citizens? There are different interpretations of a global citizen, so what exactly are international schools promising when they claim to be educating for global citizenship? Do international schools want to instill a moral responsibility for global issues or give children of the mobile elite the capital for a head start in a competitive world? The theory of cosmopolitanism underlies the definition of the global citizen. Humans have been debating what a cosmopolitan citizen is since the Hellenistic period. We can agree that the cosmopolitan individual is one who engages meaningfully with different cultures and feels at home in the world. Cosmopolitanism is the ability to balance identity in both the local and public spheres. Yet there are 2 main types of cosmopolitanism being articulated today in the context of neo-liberal globalization. One is an ethical feeling of responsibility and social justice. 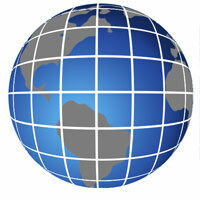 The other is a pragmatic economic global competence. Which understandings of cosmopolitanism do international schools choose? International schools are usually made up of diverse multicultural student populations, so is that enough to give students cross cultural competence, to make then internationally minded global citizens? Third culture kids have the potential to be global citizens according to both interpretations of cosmopolitanism but it requires more from international school educators. The hegemony of international schools can help children of the mobile elite transition from one country to another. Yet, by supporting this form of global education, students avoid contact with profound difference, simultaneously becoming more global and more isolated (Dolby & Rahman 2008). Third culture kids travel in a tunnel of privilege. In essence, many are just tourists (Cambridge & Thompson 2001). Indeed these children are more open to different cultures. Research shows that exposure to other students and staff from different parts of the world can increase cultural awareness traits and enhance the ability to compromise (Hayden, Rancic & Thompson 2000). However, teaching staff is drawn mainly from the UK, USA, Canada, Australia and New Zealand, limiting the exposure to non-western knowledge (Shaklee & Merz 2012). Regardless of curriculum, international schools need to do more to encourage active global citizenship. Teaching and learning with truly global perspectives (not just western liberal ones) will allow students to see how they can impact the world through their actions. Educators need to gauge if compulsory action such as CAS programs in the IB curriculum actually foster social justice or just tick boxes. 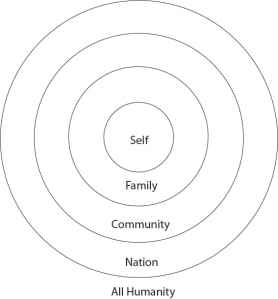 Schools could begin to look outside of the teaching staff to educate students for global citizenship (Marshall 2007). It’s up to teachers and school administrators to give students opportunities to become advocates for the world and the issues that it faces. 1. 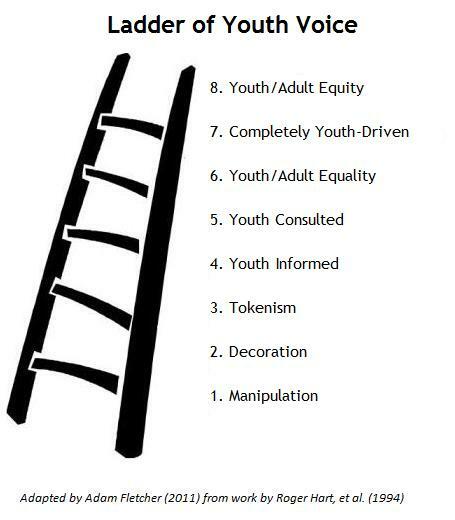 Look at the ladder of youth voice and rubric by Oxfam sociologist, Adam Fletcher. What kind of action does your school initiate? 4. Become a Fairtrade school.